Jarrod and Hayley (Anderson) Kohn were married in 2007. They reside in rural Louisville. Jarrod and Hayley are members of the First United Methodist Church in Flora and facilitate the local bereavement support group, Y.A.N.A. At age 15, Jarrod began working in funeral service by assisting with services and maintaining the cars and lawn. Jarrod received his degree in Mortuary Science from Vincennes University and has worked as a Funeral Director/Embalmer since his graduation in 1993. After Mortuary school, Jarrod served his internship at Forest Lawn Mortuary in Los Angeles, California. The following years offered the opportunity to work in every facet of the funeral business. 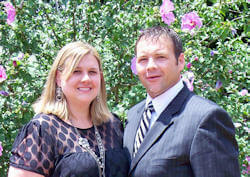 In 2005, Jarrod began serving Flora and Clay County families in every aspect of funeral service. 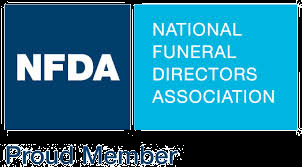 Jarrod is a licensed Illinois funeral director and is a member of the Illinois Funeral Director's Association, the National Funeral Director's Association, and the Cremation Association of North America. Jarrod is a member of the Clay County Cancer Crusaders, the Flora Elks, the Gideon's International Clay County Chapter and a member of the Flora Masonic Lodge #204. Hayley was raised in Flora and graduated from Flora High School. She obtained her degree in Elementary Education from SIU. Hayley is a science teacher at Floyd Henson Junior High School in Flora. Hayley is also the co-sponsor of the pep club, and advisor for the FHJHS yearbook. Hayley has been teaching at the junior high since 2005. She is a member of the Clay County Cancer Crusaders.